Yesterday, I was pleasantly surprised. Actually, that is an understatement~ I was overjoyed by my 9 year old daughter Diti's storytelling skills. She has always been creative and has a vivid imagination. 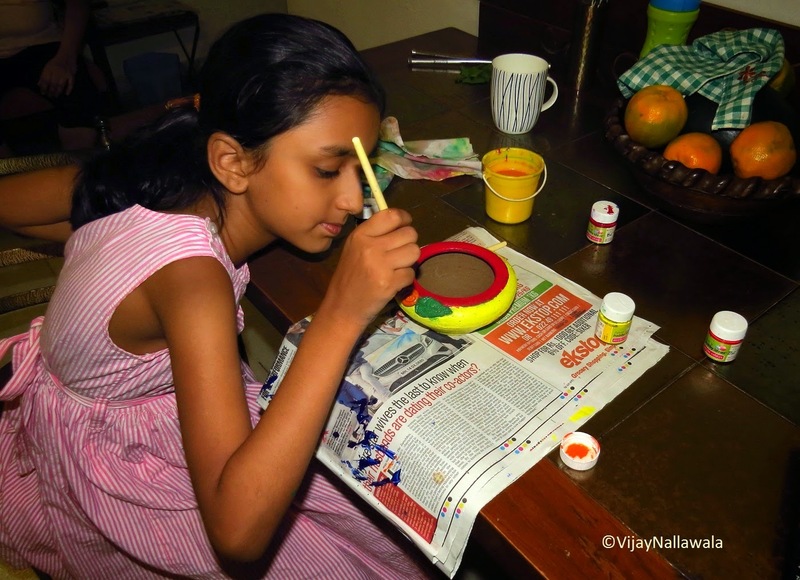 (In the picture above she's seen painting the pot that she had crafted with help of a skilled potter). However, the story that she had written yesterday surpassed any of her creative endeavours. It had been written as practice for her School exams and she was limited by the first few lines provided in her worksheet, which she had to develop further into a full story, that too within twenty minutes. Without bragging any further about it, I'll share her handiwork~ it's entirely her creation. Once there was a merchant named Rasham. He lived in the hills of Himachal Pradesh and had gone to Jaipur in Rajasthan for business. After finishing his work he was riding back home. He had a bag which had a large sum of money. Suddenly there was a storm and it started raining heavily. The merchant thought " this cotton bag is full of money which will get wet in the rain. If I don't find a safe place I'll loose all my money!" He was searching for shelter but he could not find any such place. He thought God was cruel. But he did not lose hope and tried again to find shelter. At last he found a hut and maybe he could stay there until the storm ended. A crying man opened the door of the hut and let him in. 'Why are you crying', asked Rasham. "Yesterday some robbers came here and told me to give them one lakh rupees. If I did not do as they said, they said they would kill me. I am very poor. Where will I get the money to pay them?" cried the poor man. The merchant felt bad for the poor man . He asked him where did the robbers live. "Two kilometers from away from my hut"
The merchant went as he was told and saw the hut. From the hut people looking like robbers came out. The robbers told the merchant to give them the bag of money. The merchant tried to escape as he got scared. The robbers fired at him but because of the rain the pistol had got wet and did not go off! Then the merchant saw a sword and with it he killed all the robbers! On his way back home, he went to the poor man's hut who thanks him for saving his life. Then he reached his home safe. As soon as he enters his house he sees a wonderful sight~ he sees the same poor man as God! He then realises the truth and thanks God for saving his life. God tells him, "The sword with which you killed the robbers was a magical sword"
The merchant replies, "Despite me calling you cruel, you saved my life"
"No, it was you who saved a poor man's life and with all your might you bravely fought with the robbers". The merchant bowed before God. It is not only Diti's imagination that impressed me nor her story writing skills alone. Does she also have that spiritual streak in her~ Like Father Like Daughter?